3.6 out of 5 based on 10 bloggers and 4 commenters. 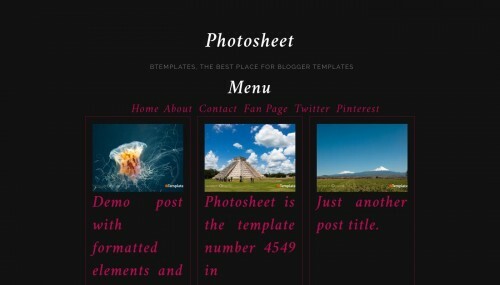 Photosheet is a free blogger template with 1 column, responsive design, seo friendly, gallery-styled, minimalist, posts thumbnails, well designed threaded comments and simple look. Excellent template for blogs about any general topic, to use as a base to create your own design, photography or a personal portfolio site. Por favor, podria indicarme si se puede cambiar el tamaño del titulo de la entrada ? ?